Imagine for a moment that you are one of the millions of Americans recently diagnosed with a serious heart condition. Now, imagine you are told not much can be done due to your age or health status. Terrifying, right? Thanks to recent advances in technology, there are promising solutions for those facing the reality of a heart condition, despite risk factors that previously limited treatment options. The best news? You don’t have to travel to a larger city for these procedures because they are being performed right now in the Shreveport/ Bossier City area. Transcatheter Aortic Valve Replacement (TAVR) is a highly specialized, minimally invasive procedure to replace heart valves. Instead of traditional open-heart surgery, which involves going through the sternum with an incision to replace the heart valve, the valve is replaced by going up through an artery in the leg during the TAVR procedure. The less-invasive, catheter-based way of fixing the heart valve condition is a great option for many older, frailer patients. The TAVR procedure offered the hope that 80-year-old Larry Wasik from Buffalo, N.Y., needed. Larry was diagnosed with aortic stenosis, a common and serious heart valve disorder where the aortic valve narrows and restricts the blood flow from the left heart chamber to the aorta. This means that the left ventricle has to work harder to pump blood, which eventually weakens the heart and leads to heart failure. In Wasik’s case, the valve condition was severe. A heart valve replacement was the only option, except that he was not a candidate for traditional heart surgery due to his two previous heart surgeries. The same reality faced Willis Andrews, a 99-year-old WWII veteran from Union Parish, La. 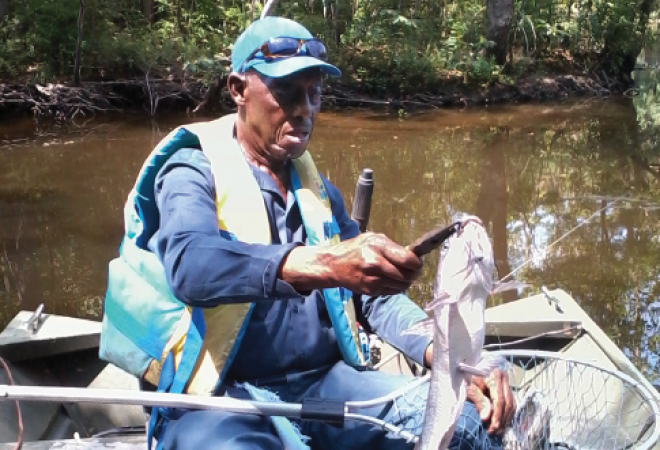 Willis was experiencing shortness of breath, swelling in his legs and other heart failure symptoms when he was hospitalized at the Shreveport VA Hospital in April 2018. He received a diagnosis of critical aortic stenosis. At his advanced age, any type of surgery carried extremely high risks, much less open-heart surgery. Luckily for both Willis Andrews and Larry Wasik, they were referred to Advanced Cardiovascular Specialists in Shreveport, La., for Transcatheter Aortic Valve Replacement (TAVR). Thanks to the TAVR operation, both Wasik and Andrews have made full recoveries. Wasik was so happy with the results that just three weeks post-operation, he took a trip to Las Vegas. Wasik has been traveling, dancing, playing cards with his friends each week, and enjoying life ever since. 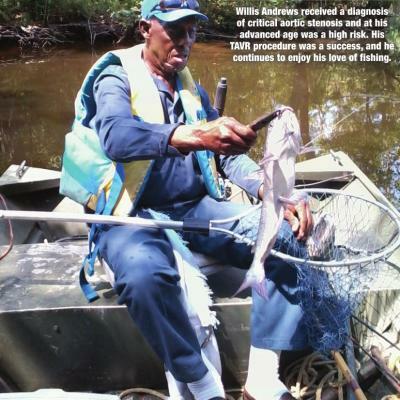 As for Willis Andrews, he is feeling better than he has in years, well enough to continue his love of fishing. “I feel like I could live 10 or 12 more years – 15,” said Willis of his new lease on life since the surgery. Aortic stenosis, particularly when it is severe, can be life-threatening. Symptoms of aortic valve stenosis may include shortness of breath, dizziness, fainting, chest pain, fatigue, heart murmur and heart palpitations. If you suffer from any of these symptoms, make an appointment with your general practitioner immediately. Your doctor will refer you to a cardiology specialist for further testing, if required. An irregular heartbeat, or Afib, occurs when the upper chambers of the heart beat in a chaotic and sometimes fast manner. This can lead to stagnation of blood in the left atrial appendage (LAA), where clots are prone to form. Traditional treatment for Afib is blood thinner, but, for some, that is not an option due to lifestyle or health conditions. Fortunately, for those individuals, there is now an alternative. The Watchman, an FDA-approved implant, provides a lifelong alternative to blood thinners for patients with non-valvular Afib. The onetime, minimally invasive procedure only takes about an hour, and most recipients are able to return to normal activities the next day. Advanced Cardiovascular Specialists in Shreveport has achieved great patient results with the Watchman over the past year. Anyone interested in the Watchman should consult his or her cardiologist or general practitioner for more information. For patients diagnosed with rhythm disturbances or heart failure, continuous monitoring of their condition has become a critical component of care. Through remote cardiac monitoring, physicians can review a patient’s heart activity and device performance without the patient needing to physically be present. Not only does this allow for fewer in-person office visits, but it has also proven efficiencies in detecting clinical events. Insertable cardiac monitors, such as The Reveal LINQ, provide better health care and peace of mind for individuals experiencing rhythm disturbances. The Reveal LINQ monitor is placed just under the skin and transmits information directly to your doctor. If your doctor sees anything of concern, he or she is able to contact you immediately to set up an appointment. Patients in need of a pacemaker or defibrillator now also benefit from remote cardiac monitoring, as newer devices are equipped with sophisticated monitoring systems. The systems, which transmit information to doctors via the Pacemaker and Defibrillator Clinic at ACS, allow for more efficient follow-up care and improved patient outcomes. For Shreveport-Bossier residents diagnosed with a heart condition, there are now promising options available right here in our area. For more information about these procedures or Advanced Cardiovascular Specialists, visit www.acsdoctors.com. Ralph Baucum III, MD, is a cardiology specialist in Shreveport, La., and has been practicing for 31 years. He graduated from Louisiana State University School of Medicine in New Orleans in 1988.